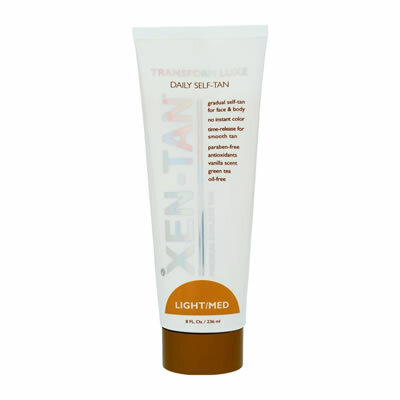 Xen-Tan Transform Luxe is a rich gradual tanner with an extra boost of tanning ingredient for a darker colour. See results in a single application and say Bye-Bye to those in between pale days that occur between self-tanning applications and Hello to a natural looking even colour that won't fade away! Perfect for those who love to self-tan and those who don't (or those who don't want to admit it, their secret is completely safe with Transform). TRANSFORM doesn't look, smell, or feel like a self-tanner. With a delicious scent, designed to appeal to both women and men alike and a weightless texture, you can tan without even thinking about it. Just apply it as you would your daily moisturiser. Before you start to think of all those sticky, smelly gradual tanners and decide to stop reading, Transform is different. - It is a completely non-sticky lotion that smells yummy and feels like nothing on your skin. It allows you to build a beautiful realistic tan daily, without even remembering you are wearing a self-tanner. Even in the hottest conditions the lotion will never feel sticky or leave an awful odour on your skin. Most daily tanners require a week of applying before you can see any results. Transform's Innovative time-release formula is completely unique as you actually see results with your very first application.